Lock in a great price for Hotel Hey Peñíscola – rated 8.7 by recent guests! The room and the balcony were great. The view from the room was ok. The staff was great. Beds ok. Brilliant location just across the road from miles of beach. Fantastic, modern design bedrooms with terrace, loungers and sea view. Magnificent sea view from the room. The hotel is almost on the beach. Just cross the pedestrian road. Just the perfect beach hotel. The breakfast was of good fresh quality and selection The staff were very friendly and efficent The location is a little way from the main town but a good cheap bus service was good no need to drive. Quiet location right next to the beach. An easy 20 minute walk to Peñíscola main town. All staff really friendly and helpful. Good sized rooms with sea view deck. Comfy beds, good sea view Couldn't get a seat on terraza at lunch time for just drinks. 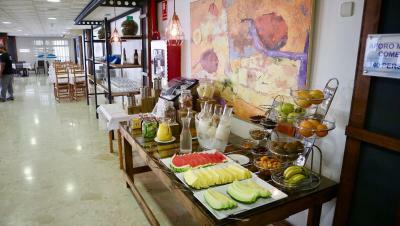 Modern hotel, comfy beds, great sea view and excellent, well presented breakfast. Hotel Hey Peñíscola This rating is a reflection of how the property compares to the industry standard when it comes to price, facilities and services available. It's based on a self-evaluation by the property. Use this rating to help choose your stay! One of our top picks in Peniscola.This beachfront hotel is located a few steps from Peñiscola Beach and 0.9 mi from the old town. It offers outdoor swimming pools, a sun terrace with Meditarranean views, hot tubs and free Wi-Fi. Hotel Hey Peñíscola’s bright, air-conditioned rooms feature terraces with scenic sea views. They include flat-screen satellite TV, a safe and private bathroom with hairdryer. 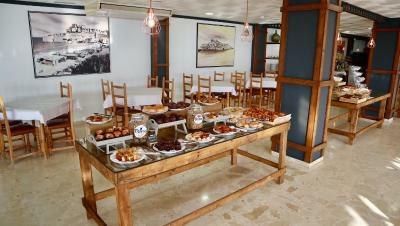 A buffet breakfast is served and Hey Peñíscola’s restaurant offers dishes featuring regional cuisine. There is also a cafeteria, a TV lounge and pool table, as well as adult and children’s pools. The hotel is approximately 1.2 mi from the famous Papa Luna Castle. The Museo del Mar Museum is 3.7 mi away, while the Sierra d’Irta Nature Reserve is a 10-minute drive from the hotel. 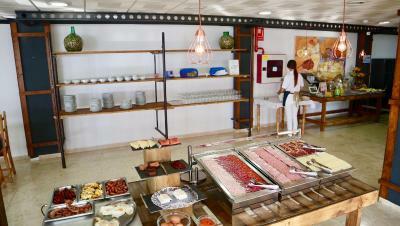 Hotel Hey Peñíscola is 1 hour 20 minutes’ drive from Valencia and Reus Airports. Benicarló is 3.4 mi away. When would you like to stay at Hotel Hey Peñíscola? This bright, air-conditioned and modern room features a terrace with scenic sea views. It includes free WiFi and has a 32" flat-screen satellite TV, a safety deposit box and an private bathroom with a shower and a hairdryer. This bright, air-conditioned and modern room features a terrace with scenic sea views. It includes free WiFi and has a 32" flat-screen satellite TV, a safety deposit box and an private bathroom with a shower and hairdryer. This modern double room has a terrace with views of the sea and is equipped with air conditioning, a 32" flat-screen TV, and a safety deposit box. The private bathroom includes a shower and a hairdryer. This triple room has air conditioning, satellite TV and soundproofing. This twin room features air conditioning and soundproofing. House Rules Hotel Hey Peñíscola takes special requests – add in the next step! Hotel Hey Peñíscola accepts these cards and reserves the right to temporarily hold an amount prior to arrival. If you expect to arrive after 17:00, please inform Hotel Hey Peñíscola in advance. You can use the Special Requests box when booking or contact the property. Please note that drinks are not included. Add tea-coffee facilities. Choice for breakfast is too scarce. Parking was difficult to get at the hotel, however there is free street parking within 400 meters of the hotel. Hotel is a bit further out from the city centre, although relative walking distance and buses running back and forth. Not a very spacious terraza especially at lunch time, no out side area just for drinks. Small pool. no sun loungers only chairs - but we knew this before we booked, so not a problem for us. Quite far from main beach and old town, limited parking in spite of request, had to pay and park in busy street. It's a long walk into the old town/ fortress -- but there is a bus service every 30 minutes!